The use of instrument adjusting, such as with the Athrostim®, allows for fewer side-effects and less post-treatment muscle soreness. If this seems like a form of treatment you may be interested in, consult with your chiropractor and ask if it may be possible to incorporate Athrostim® adjusting into your treatment regime. If you are looking for a gentle Chiropractic Adjustment in Lewisville, the Athrostim® is definitely for you! 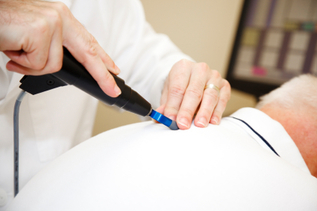 Dr. B is fully trained in using the Athrostim® at her Lewisville Chiropractic Clinic. The Athrostim is gentle enough for Chiropractic care for babies, children and the Elderly. If you are looking for a Lewisville Chiropractor for your Baby, Child, or even while you are Pregnant, this may be the treatment for you. Call us today and schedule an appointment to find out how Shine Chiropractic can help you with Pains, Injuries, Sleep issues, range of motion issues, headaches and more!